NIRMAL WEEKLY LOTTERY LOTTERY NO. NR-56th DRAW held on 16/02/2018 - Today Live Kerala Lottery Results:17/12/2018 "Win-Win W-491"
Kerala Lottery Results of Nirmal Weekly NR-57 as on 16/2/2018 has been published. First prize of Nirmal Weekly NR57 is Rs: 70 lacs. . You can see today's Kerala Lottery Results as on Friday, February 16, 2018 . 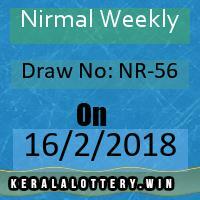 Kerala Nirmal Weekly online result, 16-02-2018 lottery , KeralaLottery Results are also uploaded in video format to Youtube . Subscribe to our youtube Channel at https://www.youtube.com/c/Kerlot . Official pdf of Nirmalweekly is also available for download. Nirmalweekly NR 57 Results of 16.2.2018 can also be seen by downloading our Android App from Play store.